Teaching my Sunday school class today took my mind back to Sierra Leone and to September 4, 1969. 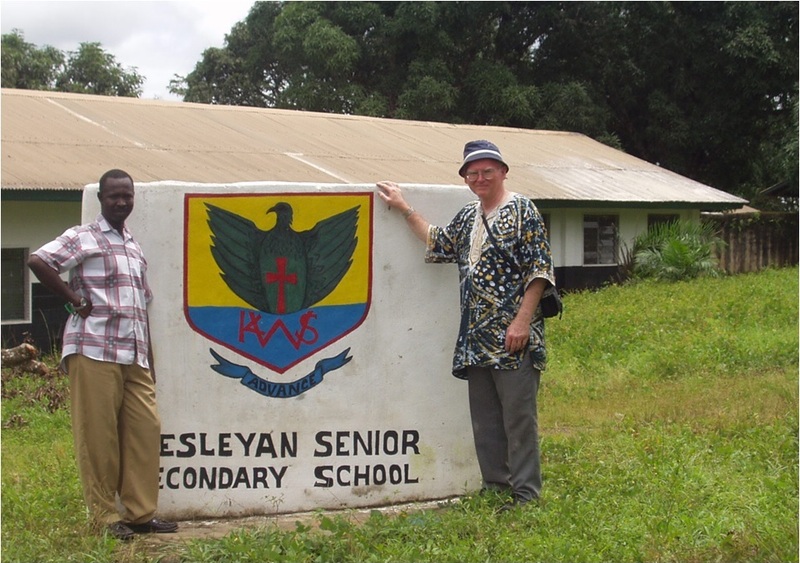 Rosa and I had just arrived in Kamakwie, Sierra Leone, West Africa, where I was to be chaplain and Bible teacher at Kamakwie Secondary School (see the picture in my last blog). We had been married on August 15 and I had been ordained to the ministry on August 17. Then, on September 2, we arrived in Freetown for a three-year term of missionary service. For the first three to four weeks of that school term the students learned nothing in Bible class. I mean this literally—none of the students learned anything! The Sierra Leonean proverb runs: “If every tree you climb has ants on it, check your own pants.” The fault was obviously mine—I spoke too quickly in American English and used educational methods foreign to their background. What was I going to do? I either had to find a way to communicate with these kids—or, go back to America! There were many facets in my adaptation to Sierra Leonean ways that enabled me, with God’s help, to become a successful secondary school teacher. One thing I did was to focus on the persons of the Biblical story. What was the difference between the Old Testament and the New Testament? Why, the Old Testament was about Adam, Abraham, Isaac, Jacob, Joseph, Moses, David, Solomon, and the prophets. The New Testament was about Jesus and the people who followed Him. Many of the students were already familiar with several of these names either through Bible stories taught in primary school or through Muslim teaching that recognized some of these same people. Today in my Sunday school class I discovered that Biblical names could help adult Americans as well as teenage Sierra Leoneans. Our lesson was on God’s promising David that he would establish his sons as his “house” who would rule after him. You can find it in 2 Samuel 7. I wanted to put David in Biblical perspective. So I asked the class, “After Adam, who are the ‘big four’ in the Old Testament?” Abraham, Moses, and David were clear answers. The class was ambivalent about number four. I argued for Solomon—Abraham, Moses, David, and Solomon. The next question was, “How are these four related?” “How does the Biblical story tie them together?” “What role does each play?” We talked about Abraham, Moses, and David today. Solomon as the beginning of David’s house is going to get our attention next week—when we look at Jesus’ genealogy in Matthew 1. The relationship of these three—Abraham, Moses, David—is integral to the Biblical story. In Adam humanity rebelled and was separated from God. The three relationships that made up God’s plan of blessing for human beings was ruptured—fellowship with God, harmonious fellowship among people, and responsible enjoyment of the world. When God called Abraham, he promised him that through Abraham’s family God would bless the world by restoring those very three relationships. Then, by delivering his people from Egypt under Moses, God began to fulfill his promise to Abraham. God’s people, however, refused to live in harmony under God’s laws, so they began to suffer. God made David king with the purpose that he, and his descendents, would overcome the people’s rebellion by leading them in faithful obedience. Then I realized that what I was teaching my class paralleled Christian Faith in the Old Testament: the Bible of the Apostles, my book just released by Thomas Nelson last month. Chapter one covers Adam; chapter two, Abraham; chapters three and four, Moses; chapters five and six, David and Solomon. What do you think? I’d like to hear about your experience. Have you used Biblical persons as a way to tie the whole Bible together? Next Time: I hope to expand on this subject in next week’s blog. Here, again, is an endorsement for Christian Faith in the Old Testament. Posted in Africa, New Book! One night—a Sermon, a Mosque, and a Cross (2 Corinthians 4:5). A picture taken at Kamakwie Secondary School in 2002. The Principal, Mr. Hemo Brima, on the left. Scripture Union camp was a spiritual highlight for secondary school students in Sierra Leone, West Africa. As chaplain and Bible teacher at Kamakwie Secondary School, it was my delightful privilege to participate in these camps. I am thinking particularly of a camp held at the Secondary School for Girls near Magburaka. It was always the custom at these camps to spend one night in village evangelism. We had walked to a nearby village. The young man who was to preach the gospel that night stood facing one of the houses. Fifty or sixty feet separated him from the house. The congregation was gathered in those fifty-sixty feet and on the houses’ veranda. I was sitting as inconspicuously as possible in a back corner on a side-wall in the shadows. A small Mosque was located next to this house. At the hour of evening prayer a half-dozen or so men entered this Mosque and began to pray. The Mosque’s hurricane lantern cast their shadows where I could see them as the men bowed to the ground and then again stood. With one ear I listened to the rhythm of these Arabic prayers, with the other, to the passionate proclamation of the Gospel of Christ. The difference was striking. 2 Corinthians 4:5 makes one aspect of this difference clear: “For what we proclaim is not ourselves, but Jesus Christ as Lord, with ourselves as your servants for Jesus’ sake” (ESV). A “Muslim” is one who is a servant or slave of God. We, however, who follow Jesus, are not simply called to be God’s servants or Christ’s servants, but servants of others for Jesus’ sake! We follow the one who said, “I am among you as the one who serves” (Luke 22:27 ESV); “If I then, your Lord and Teacher, have washed your feet, you also ought to wash one another’s feet” (John 13:14 ESV); and “For even the Son of Man came not to be served but to serve, and to give his life as a ransom for many.” (Mark 10:45 ESV, cf. Matthew 20:28). And then he proved it by going to the Cross! My wife Rosa had a dangerous, life-threatening delivery with our oldest daughter. We were in Sierra Leone. Although I was in the operating room, the attending lady physician, a colleague and close friend, would not look me in the face—her face was pale and her lips were tightly pursed. God told a godly African woman, known as a prayer warrior, to go and pray when she heard Mrs. Cockerill was in labor. God answered that prayer, and we have been thankful ever since. Some mission boards require missionaries to have several hundred prayer partners before they can go to their place of service. God invites us in Scripture to pray for our needs, for the needs of others, and especially for those engaged in his service. We know that God is not limited by our prayers, and yet sometimes we pray and ask others to pray because we feel that the more people who join us in prayer the more likely God is to answer. When we turn to the eleventh verse of this passage (2 Corinthians 1:3-11), we are astounded: “You also must help us by prayer, so that many will give thanks on our behalf for the blessing granted us through the prayers of many” (2 Corinthians 1:11 ESV). Paul urges the Corinthian believers to pray for his deliverance and the furtherance of the Gospel, not so that God will answer, but so that they will increase the number of those who give thanks when God does answer! Paul is so confident of God’s answer that he is sure it will lead to thanksgiving! God chooses to act through our prayers—and sometimes not to act if we do not pray—because he wants us to know that He is answering! He wants to draw us close to himself through his gracious action and our grateful thanksgiving. What a privilege to pray aright (praying aright may be a topic for another day), to witness God’s answers, and to give thanks. Since my previous post by this title we have continued studying 2 Corinthians 1:3-11 in two more Thursday night classes, with four or five of us in the room and our three friends joining us by Skype from Seattle, greater Mobile, and Mexico City. We have become acutely aware that Paul is talking about the severe real-life suffering that he has endured in the Roman Province of “Asia” (verse 8) for the sake of Christ. 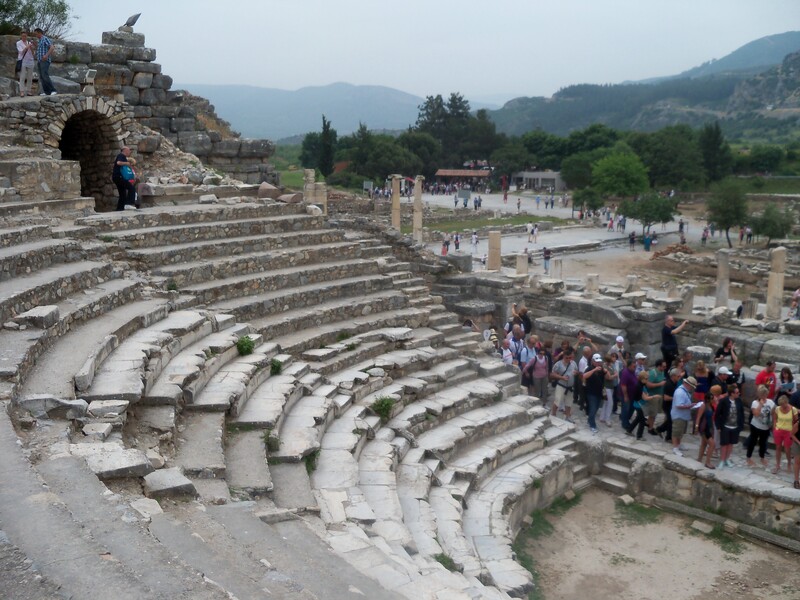 From Acts we know about the riot in the Amphitheater at Ephesus that was caused by the success of Paul’s Asian ministry (Acts 19:21-41). You can see a bit of this Amphitheater in the attached picture. When we realize the severity of Paul’s suffering—he says that he had “despaired of life” itself—verse 7 becomes all the more shocking: “Our hope for you is unshaken, for we know that as you share in our sufferings, you will also share in our comfort” (ESV). How can Paul be so sure that the Corinthian believers will share in God’s “comfort” because they share in the same kind of sufferings that Paul has endured? Is “suffering” a guarantee of “comfort”? Paul is confident that the faithful believer will receive God’s “comfort” in the midst of suffering because God is faithful. As the “Father of our Lord Jesus Christ” He is the “Father of mercies” and thus the source of the truest and deepest “comfort.” Since He is the “God who raises the dead” He is able to provide “comfort” for those toward whom “the sufferings of Christ” abound. No situation, however dire, is beyond his reach. Paul is talking, first of all, about the affliction through which we identify with Christ’s suffering because it is endured for the sake of Christ and in order that we might be faithful. Suffering from other sources, however, may well threaten the faithful endurance of the believer. God’s “comfort” is there first of all in the form of grace and power to faithfully persevere in obedience whatever we may face (verse 6). God’s “comfort” may also be expressed in deliverance from peril and danger, as it was for Paul “in Asia” (verse 8). Resurrection life is the ultimate “comfort” offered by the “God who raises the dead.” As Paul says in verse 9, suffering is the occasion for deepening our trust in God. I often fret in the middle of difficulties because I cannot see God’s solution (come to think of it, if I could “see” the solution, what need would there be for faith?). Paul, however, would have us take “comfort” in God’s “comfort”—even when we don’t see His solution—because we know He is faithful, and we know that the “Father of mercies” “knows our frame” and “remembers that we are dust” (Psalm 103:14). Last night’s Wesley Biblical Seminary class on 2 Corinthians was rich. We were studying 2 Cor 2:3-11 using both the English and Greek text. This class is a wonderful mix of people, men and women of various ages involved in various ministry contexts—all motivated to understand and obey God’s word. There were five of us in the room and three more who joined us by Skype—one in Portland, Oregon, one near Mobile, Alabama, and one in Mexico City. Their three faces on the large TV screen at the end of the room reminded us of news correspondents—we had our correspondent on the west coast, our correspondent on the gulf coast, and our correspondent in Mexico City. We, however, were not interested in the evening news, but in the unchanging but every relevant truth of the Gospel found in 2 Corinthians 1:3-11. Together we traced the logical structure of this passage. The God of all comfort who comforted Paul was also the God who would comfort and sustain the Corinthian Christians in the middle of their sufferings for Christ (2 Cor 1:3-7). Paul adds his own testimony to the faithfulness of God in verses 8-11. He begins by praising the “Father of mercies and God of all comfort” and ends by urging the Corinthians to join in prayer for his deliverance so that, when God delivers, they, along with many others, will give God thanks. Well, I’ve been away for some time. My children and grandchildren who live in Central Asia have been home for Thanksgiving and Christmas. We had a great Christmas together. Our family saw them off at the airport today. Their return to Asia reminded me of our “Mango” Christmases in Africa when our children were young. When I went to Sierra Leone, West Africa, I thought that Christmas in America would be one of the things I missed most. How mistaken I was. Some of my family’s best Christmases were our African “mango” Christmases. Christmas there was uncomplicated. There was little commercialism or shopping bustle. Gifts were simple–and meaningful. One year I made doll houses for our daughters–out of five-eight inch plywood! Those doll houses had to be sturdy enough to ride in the back of a pickup over bumpy roads! Some of the paint wasn’t quite dry Christmas morning. Then there were the Christmas carols. Our Sierra Leonean friends–and others who didn’t even know us–would come around at night singing Christmas carols, sometimes late at night. One night about eleven o’clock members of the brass band from the local teachers’ college showed up at our doorstep playing the familiar songs about Christ’s birth. Of course we got up and “thanked” them. It was in Sierra Leone–on our eldest daughter’s first Christmas–that we began our long standing tradition of having Jesus’ Birthday Party on Christmas eve! Over the years we have invited all sorts of people to this party. The cake has been different every year. Some of those cakes have become famous. However, it has never been just a birthday party–it has always been a celebration of the Incarnation. Every year we explain–in child-friendly language–that we celebrate Christmas because on that first Christmas God’s Son became a human being like us! And Christmas day–O, Christmas Day in Sierra Leone. Of course we opened presents, but then it was off to a wonderful Church service, that lasted from two to three hours. Everyone came in new clothes. There would be singing groups and testimonies. It was a joyful celebration of our Lord’s birth. Then, when we lived in a village, all of the believers ate Christmas dinner together. We would invite passers-by to join us. When we lived in town, people sent special Christmas dinners to each other–we would usually get dinners from about three of the best cooks around! The best Sierra Leonean food you could put in your mouth! We discovered that Sierra Leoneans liked popcorn. So we usually made traditional popcorn balls of different colors and sent them to our friends. They were always a big hit. Those Sierra Leone “mango” Christmases taught me and my family to keep our focus on the true meaning of Christmas–the unspeakably wonderful incarnation of the Son of God. They helped to insulate us against the superficiality of the so-called “holiday season.” Thus, thank God, they have made all of our subsequent Christmases more joyful, as we wait the return in Glory of the one born in a manger. As noted below, our first home in Africa was in a mango grove. In season, boys liked to throw stones into the branches of the trees in order to dislodge those juicy mangoes. Not a problem–except stones don’t do well when they land on a tin roof. One day I thought I’d stop the young stoner who was bombarding our roof in his effort to get mangoes. I got within a few feet of him by walking up on the other side of a tree that was between us. Then I jumped out. He ran, and I fell over a root and had sore ribs for a week. Who cares about stones on a roof. Stones are better than sore bones any day!